It may sound redundant, but to many people a Hitchcock film would not be a Hitchcock film without Hitchcock. By this I mean not only Hitchcock’s masterful command of light and shadow, camera movement, and editing, but also the brief, witty appearances of the man himself, in front of the camera. Of course we have the droll intro of the great director's own TV show, with his silhouette sliding into a cartoon of his jowly profile. We also have the chance to spot him nearly everywhere else in his body of work since he appears—as a bystander or as some form of comic relief—in 37 of his films: from 1927’s The Lodger to 1976’s Family Plot. In this last cameo, as you can see below, he appears again in silhouette. 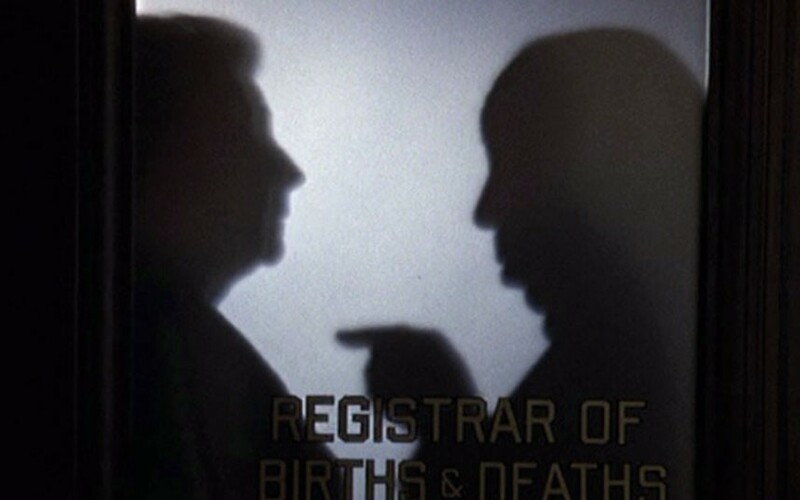 The Hitchcock cameos began by accident, writes MysteryNet, when, “short an actor in one of his first films, Hitchcock took it upon himself to play the small part.” In this movie, The Lodger (watch it online), Hitchcock actually appears twice—as a newsroom clerk and again later in a crowd. He would make two appearances in three more films: Suspicion, Rope, and Under Capricorn. Most of his cameos are very brief, some shot at a distance, and others with his back to the camera. To spot Hitchcock in your favorite of his films [you can watch 23 for free in our collection of Free Hitchcock films], see AMC’s complete list, which features thumbnails and approximations of how many minutes into the film he appears. 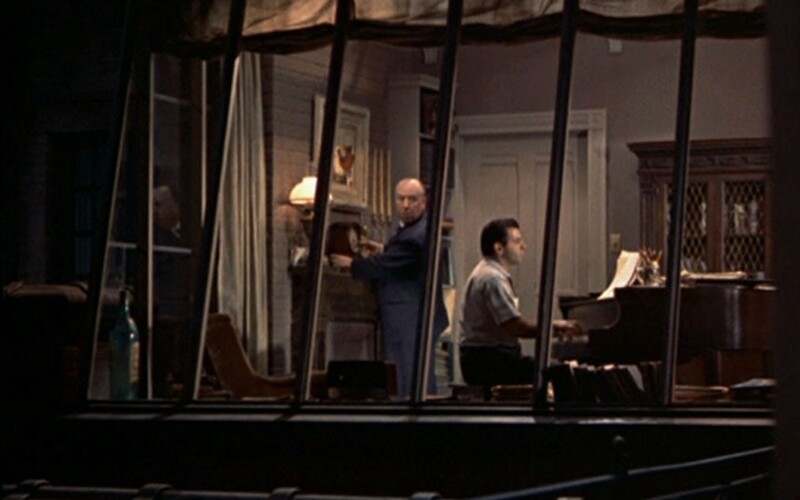 Also don’t miss The Telegraph’s comprehensive gallery of stills of Hitchcock’s cameos, like that of his Rear Window appearance above. The Well-Tempered Clavier, composed by JS Bach between 1722 and 1742, remains one of the most innovative and influential works in the history of Western classical music. A website from Northern Arizona State U. sums up what essentially made Bach's composition -- a collection of 48 preludes and fugues spread across two volumes -- so innovative, so influential. One of Bach's primary purposes in composing these cycles was to demonstrate the feasibility of the "well tempered" tuning system that would allow for composition in every key. Another purpose of the Well-Tempered Clavier was to reveal how modern and progressive composition could be informed by conservative ideas. The Well-Tempered Clavier is an encyclopedia of national and historical styles and idioms. Its influences range from the white-note style of the Renaissance motet to the French manier. Ironically, half of this stylistic smorgasbord is expressed in fugue, a form that was out of date upon the cycle's completion. Bach was of course aware of this. His hope was to defend the venerable form by demonstrating how it could absorb contemporary flavors. If you've never experienced Bach's piece, then I'd encourage you to listen to the 1960s recording by Glenn Gould. Or watch a section of the piece being performed on the All of Bach website -- a site that will eventually put 1080 Bach performances online, for free. Then it was a question of rendering the animated data in CGI within the virtual space created especially for the animation. This too, was no mean feat, even for the army of cloud-based computers that had a hand in the task. Each frame took 15 minutes to render because of the thousands of calculations involved in activating each light as well as the shadows, glows and reflections required to make the scene look truly life-like. Sinfini Music, which commissioned this project, has more on Warburton's creation here. Hope this gets your weekend started on the right, er, note. A few weeks ago, we featured Benedict Cumberbatch's reading of the letter Alan Turing (whom Cumberbatch portrayed in last year's The Imitation Game) wrote before his 1952 conviction of "gross indecency." It came from Letters Live, "a series of live events celebrating the power of literary correspondence" put on by publisher Canongate and Cumberbatch's production company SunnyMarch and "inspired by Shaun Usher's Letters of Note" — a site Open Culture readers surely know well by now. Back in 2013, Josh Jones wrote a post here on Virginia Woolf's handwritten 1941 suicide note, "a haunting and beautiful document, in all its unadorned sincerity behind which much turmoil and anguish lie." Having seen that note, perhaps you'd also like to hear it performed. If so, you'll want to watch the Letters Live video at the top of the post, which offers an interpretation of the To the Lighthouse author's declaration that "I can't fight any longer" by Cumberbatch's Sherlock co-star Louise Brealey. If you haven't had your fill of literary correspondence read aloud by these noted British performers, do pay a visit to Letters Live's Youtube page, where you can also hear Brealey reading letters from Bessie Moore and Clementine Churchill as well as Cumberbatch reading letters from Chris Barker and more from Alan Turing. Watching internet videos of live performances of traditional letters — the mind may reel at all these simultaneous layers of mediation and interpretation, but the pieces of correspondence chosen still speak straight to the heart. Imagine the dress up fun we could have in Grandma’s attic, if Grandma were Frida Kahlo (1907 – 1954) and the attic was a sealed off Mexico City bathroom where Grandpa - artist Diego Rivera, natch - had stashed all her stuff. Yellow-laced scarlet booties trimmed with beads! 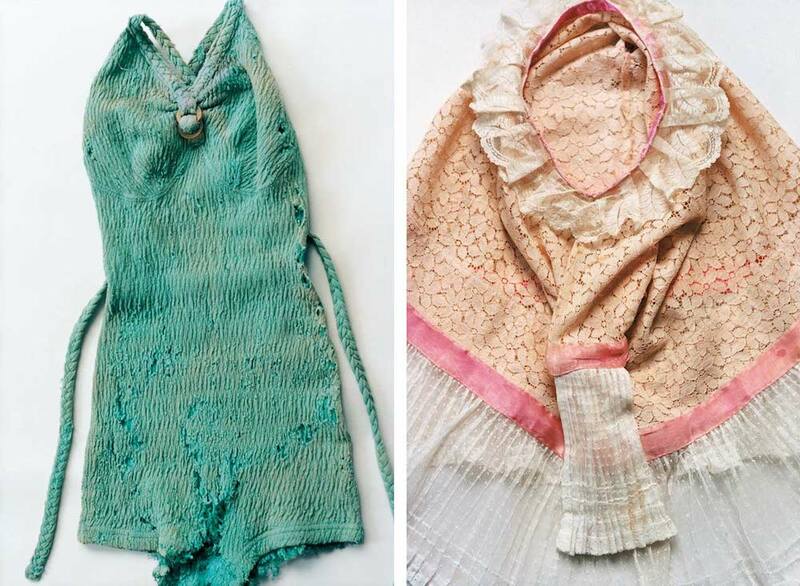 A glamorous, rotting swimsuit and an extremely familiar-looking traditional Tehuana headdress! A saucy prosthetic leg! 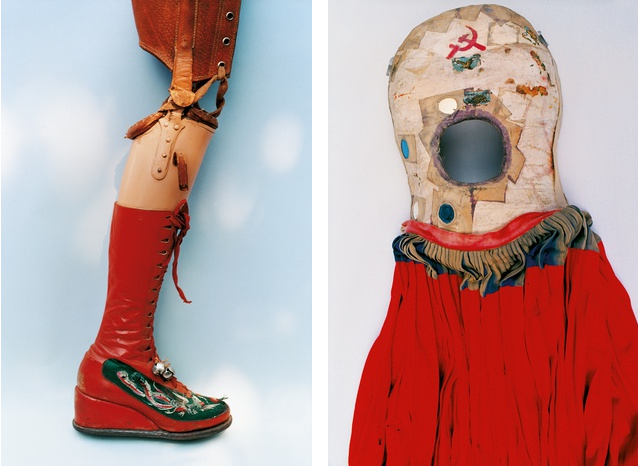 A skirted body cast embellished with hand-painted hammer and sickle. 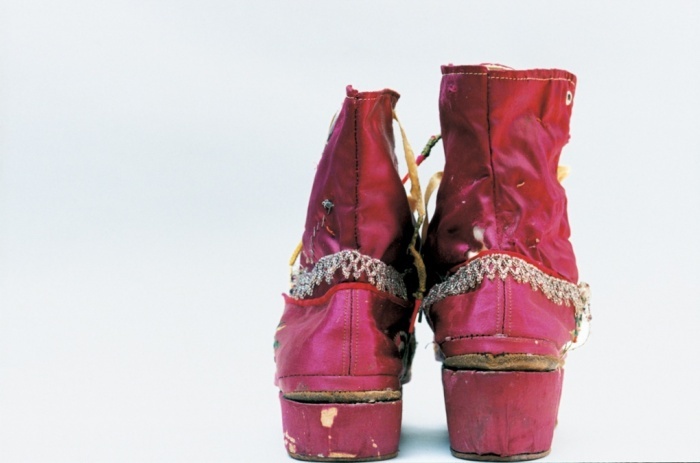 Now let us take a minute to live vicariously through photographer Ishiuchi Miyako, whose previous subjects have included the clothing of her late mother and victims of the atomic bombing of Hiroshima. In 2004, the Museo Frida Kahlo’s staff started organizing Frida's personal effects. Rivera (1886–1957) had stored them in the aforementioned Mexico city bathroom, along with instructions that the room should remain sealed for a period of 15 years following his death. In 2011, the museum invited Miyako in to document the far-from-mint condition relics, almost 300 in total. There is an intimacy to her gaze that suggests this statement might be true. Rarely have a couple of bottles of dried up nail polish exuded such sensuality. 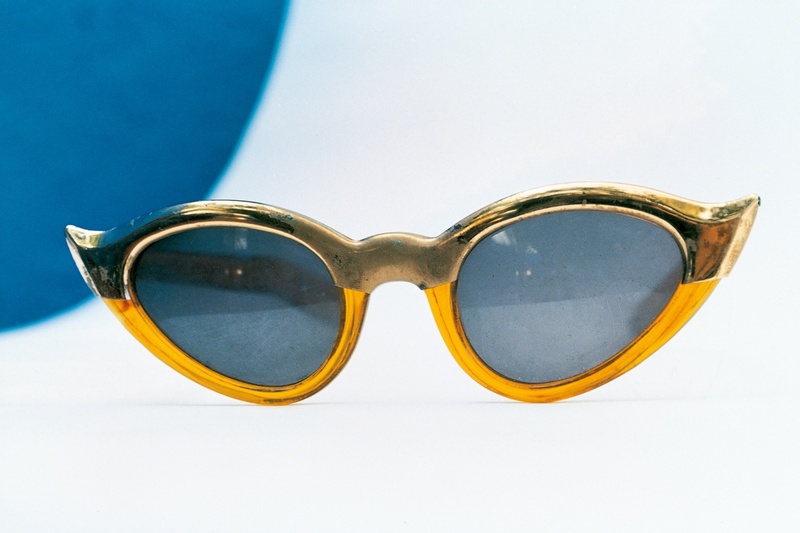 Miyako’s Frida photographs have been collected in a book, and can be seen in the flesh in London’s Michael Hoppen Gallery through mid-July. What is the meaning of life? This may sound simplistic or naïve, especially in relation to much contemporary philosophy, which assumes the question is incoherent and reserves its focus for smaller and smaller slices of experience. And, of course, prior to the rise of secular modernity, the question was answered for us—and still is for a great many people—by religion. One either believed the answer, through coercion or otherwise, or kept quiet about it. But at least since Søren Kierkegaard, philosophers in the West have taken the question very seriously, and found all of the answers wanting. By the mid-twentieth century, there seemed to thinkers like Albert Camus to be no answer. Life has no meaning. It is inherently absurd and purposeless. This Camus concluded in challenging essays like “The Myth of Sisyphus” and novels like L’Etranger, a book most of us know as The Stranger but which Alain de Botton, in his School of Life video above on Camus’ philosophy, translates as The Outsider. Reading this book, de Botton observes, “has long been an adolescent rite of passage” since many of its themes “are first tackled at seventeen or so.” Its protagonist, Meursault, an older, more nihilistic version of Holden Caulfield, illustrates Camus’ thesis through his steadfast refusal to identify with any meaning-making institutions or emotions, and through a casual, senseless murder. But while Meursault may see through the pretensions of his society, he has failed to see the world as it is. Colin Wilson, another author many people read during intellectually formative years—who wrote an existentialist study also called The Outsider—describes Meursault’s indifference to life as a product of “his sense of unreality.” Only the looming prospect of death awakens him from what Meursault calls “a heavy grime of unreality.” Instead of despairing at life's emptiness, Camus determined that true freedom required engaging fully with life, in the face of futility---with the ultimate prospect of death and the option of suicide always in view. Camus, says de Botton, “writes with exceptional intensity… as a guide for the reasons to live.” De Botton somewhat superficially praises Camus’ sexual prowess, fashion sense, and good looks as more than just “stylistic quirks,” but as markers of his psychological health. But more than just a ladies man, Camus was a “great champion of the ordinary,” as well as a champion footballer and Nobel prize-winning literary star. He was also a fully committed journalist and political activist for much of his career, who stood by his individual principles even as other leftist intellectuals got swept up in the allure of Soviet communism under Stalin. In the documentary above, we learn important details of many of these qualities, as well of Camus’ troubled early life. Given his background of impoverishment and loss, it is indeed remarkable that Camus—much more so than other, more privileged philosophers—lived such a rich, fully engaged life. In a rare television interview above, Camus answers questions about his theatrical adaptation of Dostoevsky’s The Possessed, another novel that confronts head on the question of life’s meaning. He speaks of the novel’s “nihilism,” now “the reality that we have to face.” Camus does not mention that Dostoyevsky, like the existentialist Kierkegaard, managed to salvage a kind of religious faith in the face of emptiness; the French philosopher and writer was convinced of the impossibility of such a thing. But whether one draws Dostoevsky or Camus’ conclusions, both would suggest that to live authentically, one must seriously grapple with the problem of meaninglessness and the reality of death. Chris Burden passed away on May 10 and here at Open Culture we honored him with a post about his oddly hilarious late night 1970s TV commercials. But before that, Burden entered the public consciousness with one of his ballsiest and insane performance pieces. “Shoot” (1971) consisted of the 25-year-old Burden being shot in the arm at close range by a friend wielding a rifle. A few inches off, and Burden would have probably died. Instead, as we see in the original piece above, he walks off very quickly, more in shock than pain. His intention was to be grazed by the bullet. It went a little deeper. As Burden points out in the video, only eight seconds of the brief piece exists. It was filmed, November 19, 1971 in a small gallery in Santa Ana, CA called “F Space,” a few doors down from Burden’s studio, with only a few friends in attendance. He had previously announced his intention to be shot for art to the editors of an avant-garde art journal called Avalanche. Coming at the height of the Vietnam War, the piece is about many things: trust, violence, the limits and risks of art, the role of the audience, the bravery of artists compared to the duty of soldiers. The video is now part of the MoMA and Whitney collections. Polaroid photography has seen a new wave of interest over the past decade, in large part from young photographers looking to do something different from what they can with the digital technology on which they grew up. The other modern practitioners include no less a creator than Patti Smith, who have personally witnessed the format's appearance, fade, and return. 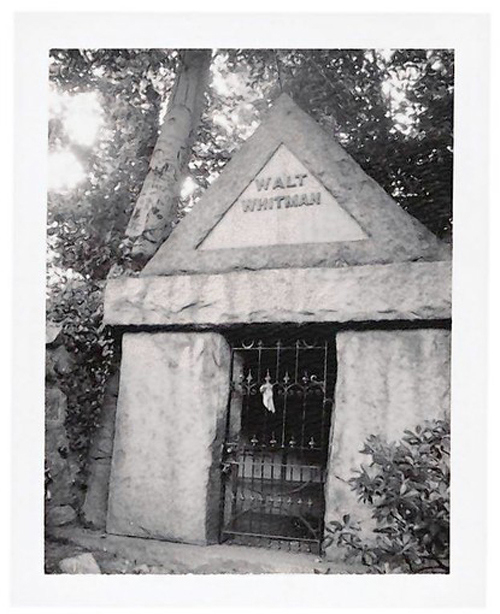 A few years ago, her Polaroid photography reached the galleries, becoming shows and installations in Connecticut and Paris. These "black-and-white silver gelatin prints made from Polaroid negatives, small and square and in soft focus," writes the New York Times' A.O. Scott, "are culled from a collection that documents hundreds of encounters with worldly effects transformed into sacred relics. A fork and a spoon that belonged to Arthur Rimbaud, the French symbolist poet who has been one of Smith’s touchstones forever. 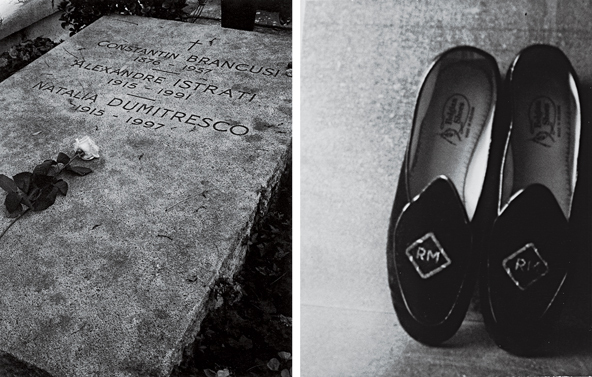 [Robert] Mapplethorpe’s bedroom slippers and the tambourine he made for Smith. 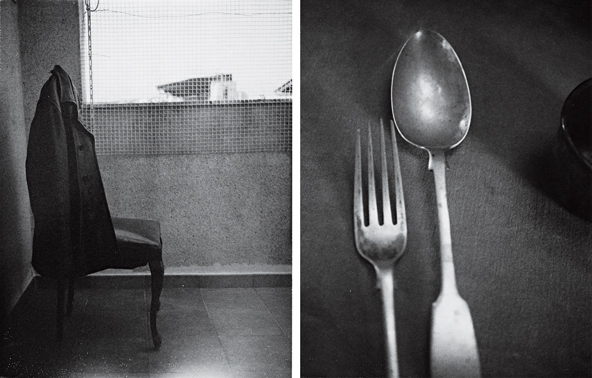 A chair that belonged to the Chilean novelist Roberto Bolaño. William S. Burroughs’s bandanna. A replica of a life mask cast from the features of William Blake." Smith's "gorgeous, misty photographs are inspired by artifacts from some of Smith’s favorite artists, from museums she has visited around the world, and many are from her personal life," writes Flavorwire's Emily Temple on "Camera Solo," the Hartford exhibition which introduced these Polaroids to America in 2011. If you didn't make it to the Wadsworth Atheneum for that show, you can still experience it through Patti Smith: Camera Solo, its companion book. Or have a look at her work on display at the BBC's site, the gallery that offers the photos of Virginia Woolf's bed, writing desk, and gravestone just above. You can see even more at this post from Lens Culture on "Land 250," the exhibition of Smith's Polaroid photography at Paris' Fondation Cartier. "I first took Polaroids in the early 1970s as components for collages," it quotes Smith as saying. "In 1995, after the death of my husband, I was unable to center on the complex process of drawing, recording or writing a poem. The need for immediacy drew me again to the Polaroid. I chose a vintage Land 100." In 2002, she settled on the Land 250, the venerable instant camera that gave the Paris show and its associated monograph their titles. It surely counts as one of the most important artifacts of Smith's artistic life — and one with which she has captured the artifacts of so many other artistic lives important to her.